Sheep tag numbers are written on a paper form to process back in the office. On Friday 30 September I spent the day with Kirsty Shaw, Director of Service Delivery for the Animal and Plant Health Agency (APHA) visiting their field officers and vets. What I saw really brought to life some of the issues we are trying to fix in Defra at the moment to improve how we work. First we visited some egg marketing inspectors - the people responsible for enforcing egg marketing and production legislation. There were lots of forms to check and fill out, some of which are manually re-entered into the system back at the office. This is an example of how a digital process - where the data is entered once in the field - can help us to drive efficiencies. 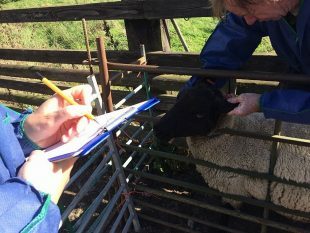 We then visited a sheep farm where an animal health officer (AHO) was preparing to take blood samples. It was a sunny day and Kirsty was there to hold the clipboard with the paperwork recording tag numbers etc. I could only imagine what this would be like on rainy day with the AHO on their own… and apparently TB testing requires even more paperwork and manual inputting! The vets told me that back in Spain they had handheld devices that scanned the tags automatically. These are some of the things I would like to see fixed by our transformation programmes across Defra. Over the next 4 years we will be encouraging all our people across Defra to embrace digital and data. We will invest £66 million in new digital services and data projects across Defra to save £100 million in annual costs - this includes rolling out new smartphones across Defra Group at the end of 2016. It would be great to hear your take on how we can improve ways of working and become a more efficient Defra Group in the future. This is most encouraging. Clearly the money spent in Defra spread around the various agencies and core department is not unlimited but It looks as if Betsy has seen how small, relatively inexpensive improvements in IT can make real difference to productivity and efficiency. It's not that we haven't been asking for these for years but time and time again we have been told that our IT security won't allow it. IT must be ten years ago that we were promised in the field recording data capture and at last our procurement and IT security processes seems to be allowing it. I hope that a strong push from above can get past the 'you can't do that' mentality and that where an obstacle to progress is encountered we will have real problem solvers in place to deal with getting the project driven through to delivery. Thanks for your comment Allister - we are trying to form a small working group to look at solutions for these issues at the moment.